If 2011 happens to be the year of the tablets, users are confused between what to buy - Apple's iconic iPad or Samsung's impressive rival and feature-rich Galaxy Tab. Techcircle.in compares features and also goes on a price hunt, searching for the best rates â€“ in the grey market, as well as in the official stores - and helps you make the right pick. Apple currently offers two variations of the iPad â€“ iPad and iPad 2. Both come in a basic Wi-Fi model, plus a Wi-Fi+3G model. They are available in 16 GB, 32 GB and 64 GB of internal storage memory. Currently, only the iPad is available in the Indian market. At least, that is what you get officially. But if you really want to go for the latest version, you can get your hands on an iPad 2 in the grey market. Samsung's P1000 Galaxy Tab offers both Wi-Fi and 3G. In fact, it works as a mobile phone and has 16 GB and 32 GB of internal memory, which can be extended up to 64 GB with the help of a MicroSD card. The Galaxy Tab is currently priced at Rs 24,900 at online shopping sites like shopping.indiatimes.com, naaptol.com and HomeShop18.com. But you can get your hands on a Galaxy Tab at much cheaper rates if you purchase it from the grey market. The iPad has a 9.7 inch LED-backlit glossy widescreen multi-touch display with IPS technology and a resolution of 1024x768 pixels while the Galaxy Tab comes with a 7 inch TFT capacitive touch screen with Gorilla glass and the more standard 1024x600 pixel resolution. Samsung Galaxy Tab runs on Android 2.2 Froyo OS and has ARM Cortex A8 processor, as well as 1 GHz processor while the iPad has a 1GHz Apple A4 custom processor. iPad 2 features a 1 GHz dual-core Apple A5 custom processor and both iPads run on Apple's OS. Apple promises a battery life of 10 hours, compared to Galaxy Tab's 7 hours, but Galaxy Tab is considerably lighter and smaller than both iPad and iPad 2. Until recently, Galaxy Tab was the only tablet by Samsung but now the company has announced two new versions â€“ Samsung Galaxy Tab 8.9 and 10.1. These tablets are yet to hit the market but according to a website called Blackfridaydeals.in, the 16 GB and 32 GB versions of the 10.1 inch device are available at a price tag of Rs 22,379 and Rs 26,864 respectively. The 16 GB and 32 GB versions of the 8.9 inch device will be available at a price tag of Rs 21,064 and Rs 25,519 respectively. If you happen to be in Mumbai, hop over to the Alfa market in Irla. It is a hub for cheap electronic goods and there you can buy a Galaxy Tab for just Rs 23,000, which is almost Rs 2,000 cheaper than its MRP. And the flip side? You won't get an authentic bill of purchase, but you can still avail the warranty from its IMEI number. Another place where you can get it even cheaper is Heera Panna, a 2 km drive from the Mumbai Central Railway Station. The price quoted here is also Rs 23,000 but if you can bargain with a vengeance, you can get it down to Rs 21,500 which is another Rs 1,500 less than the price tag at the Alfa market. The same rules apply here, though. No bill and no guarantee from the seller. 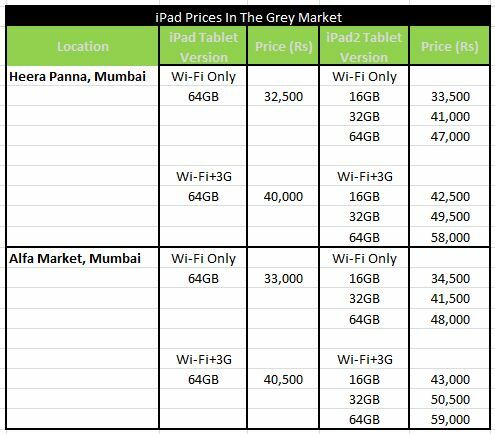 The price of the 64 GB iPad is cheaper than its MRP by a couple of thousand in the grey market. And it's the only version of iPad available since Apple has not officially launched iPad 2 in India. Consequently, there is no official pricing available while the prices are forever changing in the grey markets. Shopping sites like shopping.indiatimes.com, naaptol.com and HomeShop18.com are, however, offering iPad 2 for sale. Apart from the grey market and online shopping sites, electronic retailers also offer discounts on authentic products. One such store is Vijay Sales located in Goregaon East, Mumbai. Currently, this particular store is offering a flat 5 per cent discount on all Apple computers and iPads. Also, you may have a one-off chance to crack a deal like the one offered by Croma's store in Goregaon East. This store is offering a 21.5 inch iMac PC worth Rs 92,900 at a price of Rs 63,000. The catch â€“ it's a PC kept on demo for the customers and hence, is a used model. In the Indian grey market, people are opting for Galaxy Tab over the iPad and sellers say it is the hottest selling product in the market. Apart from being cheaper, the Galaxy Tab can also be used as a mobile phone and triumphs over the iPad for this very reason.